Amazon has launched cardless EMI with Amazon Pay, inline with Flipkart card-less EMI. It is a completely digital process. You can make the purchase on EMI using this facility. You have to complete the one-time registration process. After that, Amazon Pay EMI payment option will be available to you at the time of check out for the purchase on EMI for 3 to 12 months tenures. What are the penalty charges for late payment? 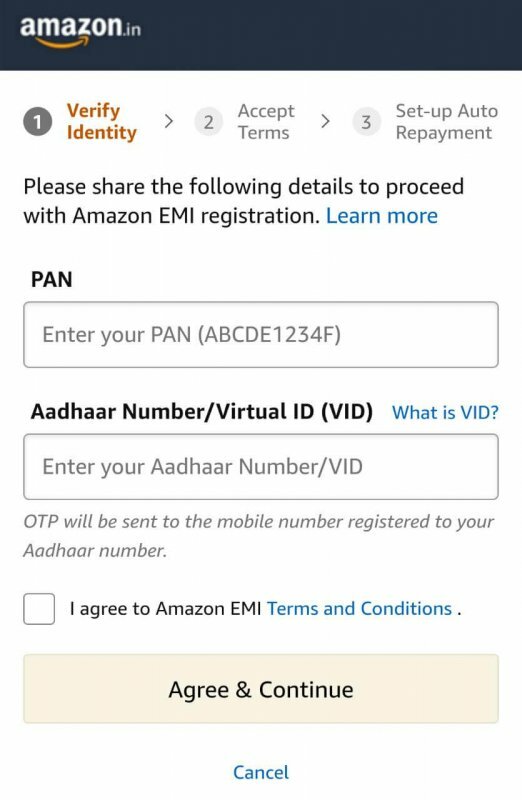 Verify your identity using PAN and Aadhaar with OTP. Read and accept the terms and conditions. Further eligibility will be decided by Amazon based on your information available with it and credit bureau. If your bank account does not have sufficient balance on due date auto-deduction will fail. You will receive notification regarding this. Amazon Pay EMI account will be blocked after a few days of due date. It will unblock after payment is made. You will be charged the late fee for the same. The value of late fee will depend on order value and delayed number of days.